Sioh Maluku [Nostalgia for the Moluccas] is guitarist Maurice Rugebregt's first solo project. After graduating from the Rotterdam Conservatory in 1996, Maurice traveled to the Moluccan capitol Ambon, in search of his roots. 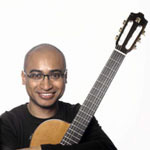 Once there, he started his search for traditional Moluccan music. He bought tapes of local folk music and taped people singing traditional songs. Upon his return home, Maurice selected several Moluccan traditionals, arranged and recorded them accompanied by some of the best Dutch jazz, latin and Moluccan musicians. The result is Sioh Maluku, a true world-music CD containing 11 refreshingly vibrant Brazilian, jazz and pop arrangements of traditional Moluccan songs. Musicians: Grandmother Kaitjily- Ririnama [vocals], Lilian Vieira [vocals], Brenda Frans [vocals], Ana Beck [vocals], Gilbert Breuer [percussion], Norman Pattiwael [percussion, tifa], Bert van den Brink [Hammond C3 organ], Willem Hellbreker [soprano and tenor saxophone], Han Slinger [double bass], Hans van Oosterhout [drums], Stanislav Mitrovic [EWI], Cajan Witmer [Fender Rhodes piano], Jazzed to the Max [vocals] featuring Mirjam Verheem [vocal arrangement], Rudy Tuhusula [totobuang], The Zapp String Quartet: Jasper le Clerq [violin], Friedmar Hitzer [violin], Oene van Geel [viola, string arrangement], Emile Visser [cello], Wiro Mahieu [double bass] and Maurice Rugebregt [guitars, tifa, arrangements]. Sioh Maluku live in Indonesia, march 2007! Sioh Maluku had a succesful tour in Indonesia. The band played at the Jakarta International Java Jazz Festival 2007 and in Makassar and Ambon. 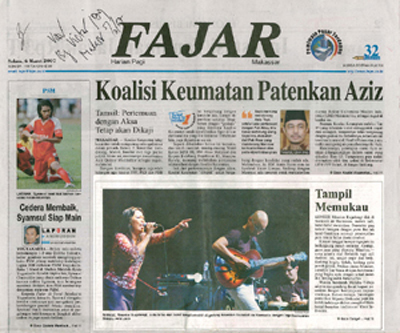 Click here to see more pictures and read the article in the Fajar Makassar newspaper.